What is precision injection mould? Precision injection moulds are tools used in mass manufacturing of plastic parts through the precision processing methods. Specifically, the molten material is injected into the mould cavity by high pressure, and after cooling and solidifying, various injection moulded part are obtained. The dimensional accuracy of the injection moulded parts produced by precision injection moulds can reach 0.01 or less, usually between 0.01 and 0.001 mm. Precision injection moulds are distinguished from conventional injection moulds. Because the plastic parts manufactured by precision injection moulds meet the high precision requirements, and have good mechanical properties and dimensional stability, precision injection moulds are commonly used in machinery, electronics, instrumentation, communications, automotive and aerospace industries. Precision injection moulding products have replaced a number of high-precision metal parts and are widely used. Chinese precision injection moulding began to develop in the 1970s, mainly in Hong Kong. The plastics and plastics machinery industry once occupied a major position in Hong Kong's overall industry. With Chinese plastics industry development, nowadays, precision injection moulds have used in various industries, but how much do you know about precision injection moulds? Today, ACO Mold Precision injection moulding factory takes you to understand it. Moulding parts: Such as mould core and cavity, which are the parts that the mostly contact with product. Gating system: The runner of molten plastic flow from the nozzle to the cavity. It can be divided into main runner, brand runner, gate, slag well, etc. Guiding system: It is used to determine the relative position of the cavity plate and core plate when mould clamping. Generally there are guide pins and guide bushes. If necessary, the ejector part also needs to be guided by the guide pins and guide bushes. Demoulding structure: It is a device for ejecting the rubber parts from the mould. Commonly used are thimbles, top plates, shreds, etc. Temperature control system: In order to meet the mould temperature requirements of the injection moulding process, the cooling water channels added to the cavity and core moulds. lateral splitting and lateral core pulling: When the rubber parts have the reverse buckle, that is, the structure is inconsistent with the demoulding direction, the slider is used. The common forms are slider, inclined top, core pulling, etc. Venting structure: There are two common forms of venting: Air venting and the gap of injection moulded parts. In order to eliminate the air in the cavity and the gas generated during the moulding process in the injection moulding process, the air venting is often set on the parting surface. The principle of setting the air venting is to make the air venting as large as possible without affecting the flash and the plough. The air of thimbles and inserts are exhausted by the gap between the moulded parts. Precision injection moulds can be divided into three categories depending on the type of gating system. Hot runner moulds: Hot runner moulds are mainly composed of hot sprue bushings, hot runner plates, and temperature-controlled electrical boxes. Common hot runner systems are available in single-point hot gates and multi-point hot gates. The single-point hot gate uses a single hot sprue sleeve to directly inject the molten plastic into mould cavity. It is suitable for a single-cavity single-gate plastic mould. The multi-point hot gate branches the molten material to each thermostatic sprue sleeve through a hot runner plate. Then enters the cavity, which is suitable for single-cavity multi-point feeding or multi-cavity moulds. The mould structure is roughly the same as the pin-point gate, and the considerable difference is that the runner is in one or more the hot runner plate and hot nozzle, demoulding no cold material, the runner and the gate are directly on the product, so the runner does not need to be demoulded. This system is also called the waterless port system, which can save raw materials and is suitable for expensive raw materials, product with high requirements, it is difficult to design and process, the injection moulding cost is high. Edge gate mould: The runner and gate are on the parting line, and the plastic product is demoulded together when the mould is opened. The design is quite simple, easy to process, and the cost is low. Therefore, many injection moulding manufacturers use the Edge gate system. Pin-point gate: The runner and gate are not on the parting line, generally directly on the product. So it is necessary to design a set of gate parting lines. The design is relatively complicated and the processing is relatively difficult. Generally, the pin-point gate system is selected according to the requirements of plastic part. 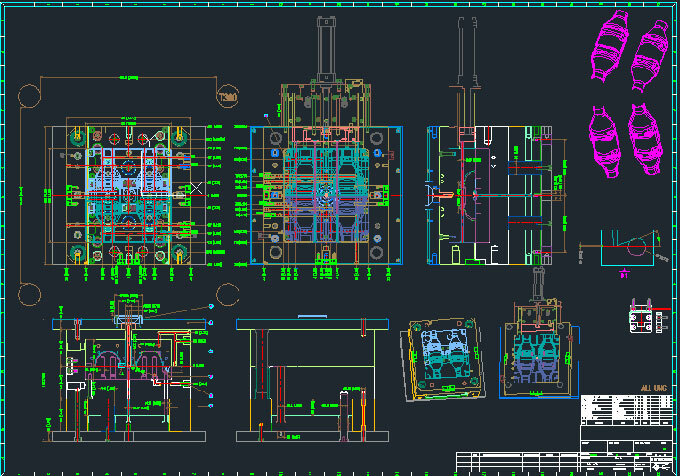 ACO Mold injection moulding company constantly meets exceeds the customer's requirements. We equipped with advanced Japanese imported equipment, WEDM Mitsubishi full range of equipment 10S, 20S, 30V, machine tool with automatic threading function, AR function, no need to correct workpiece parallelism to achieve high-precision precision parts machining, up to ±0.002mm precision machining. How does ACO Mold achieve high-precision precision parts processing? Under the technical research of the manufacturing department team, the GDM Mitsubishi slow wire-drawing equipment is used to realize the shape accuracy of 0.003 mm and the smoothness of Ra0.4μ in the processing of the Gree L-shaped split fin mould project. With the improvement of the accuracy requirements of the customers, the WEDM process precision processing team through careful preparation, bold attempts, organized ultra-precision machining technology research, and finally achieved the full shape dimensional accuracy of the following two new projects ± 0.002mm, smoothness Ra0.4μm processing requirements, the existing level of precision has broken through the processing limits of existing Mitsubishi WEDM equipment. Difficulties in machining: The thickness of the three machining positions is inconsistent, and the full size includes the distance between the three holes and the zero reference plane. Difficulties in machining: Full-size position ±0.002 mm, and the thickness of the workpiece is about 10mm, and the bottom of the hole wall is 5mm, which is easy to produce machining deformation. ACO Mold equipped with the technology and equipment for precision injection moulding and precision stamping products, providing one-stop service for customers' product projects. 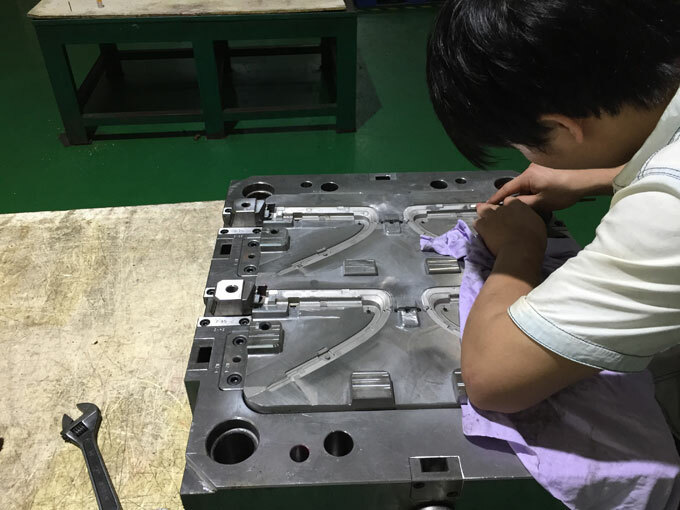 How ACO Mold ensure injection mould precision? ACO Mold equipped with the Japanese import Makino, Toshiba, Mitsubishi top precision processing equipment, to ensure the accuracy of each set of injection mould. We have the ability of manufacturing precision injection mould with the accuracy between 0.001mm-0.05mm. At the same time, with the increasing requirements of customers for the delivery capacity of precision injection moulding factory, automatic processing has become more and more important. The A100E in horizontal CNC equipment can hold 302 tools, and the A66E is automatically operated for 18 hours. The maximum speed of the machine such as F5, A33i and A56i in the vertical CNC is 30,000 rpm. 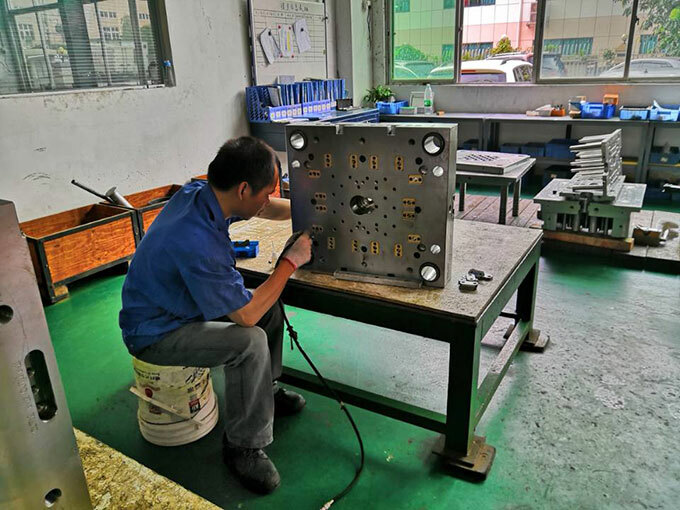 How ACO Mold meets the requirements of customers for the delivery time? ACO Mold has strong R&D strength, we have more than 10years experience of precision moulding making & precision injection moulding & products assembly. The R&D team accounts for about 30%, all using genuine development software. We have professional CAE analysis team, experienced mould design team, optimization solutions of customize plastic parts for customers, to shorten the time to market, shorten product development cycle, and improve customer product qualification rate. 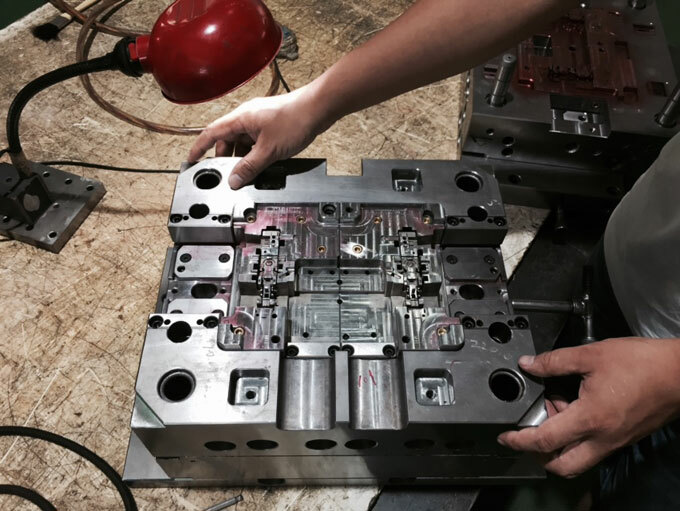 How ACO Mold ensures the high-end quality of the injection mould and injection moulded part? In quality assurance, we control the quality from incoming materials, manufacturing, shipments, etc. And the mould production stability is high. We set up a special quality management department, using high-precision testing facilities combined with automated testing methods and standardized control processes. We carry out quality control on the four aspects of incoming inspection (IQC), process inspection (IPQC), moulding inspection (FQC), and mould shipment acceptance (OQC), to meet and even exceeding the requirements of customer and help customer achieve perfect quality. ACO Mold equipped with advanced precision mould processing equipment and testing equipment, CAE/CAD/CAM technology, fully automated ERP system, we look forward to your inquiry and click on the contact page above to get injection mould quotation to help you achieve "perfect quality" and "ultra-short delivery"! Welcome to our website about injection mould & injection moulding to learn more.